Just how big of a graphic can we make? You’d think that the answer would be simple: as big as our biggest printer is wide. But it turns out that the sky’s the limit. Instead of making artwork fit the panels, the panels can be made to fit the artwork. It’s a great project for an important new scientific lab. There was just one little – make that really big – catch: their panels are bigger than our biggest printer. Obviously, this problem has occurred before – we’re not the first place to have to print huge graphics. Previously, panels like this would have been printed, laminated, seamed, and mounted by hand. And if you think that process sounds long and laborious you would be correct. For the Mathias lab, graphic specialist Jessica Schick printed the panels directly on the substrate. Cutting the panels around the artwork required incredibly precise measurements. Our raster image processing (RIP) program and the CNC router allow for just that – panels cut within 1/100 of an inch! 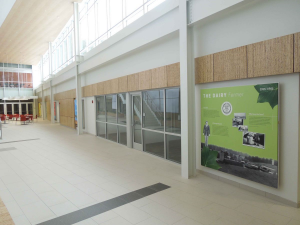 The individual panels were pieced together on-site to create the full-sized graphics. OEC installed the graphics for the September 19th opening. It went seamlessly. 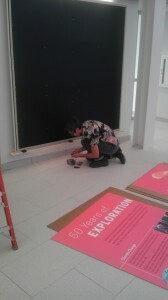 Fabricator Jordan Tierney installs the 50 Years of Exploration graphic panel. The finished panel installed at SERC’s Mathias Lab. 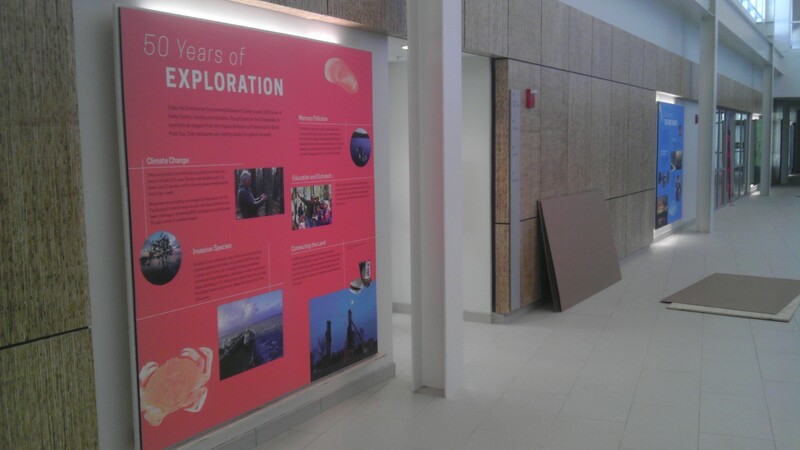 The colorful graphic panels line the hallway of the Mathias Lab.